Office of the District and Session Judge, Jalandhar has given a notification for the recruitment of 20 Peon, Orderly, Waterman, Chowkidar, Mali and Sweeper Vacancies. The interested candidates can apply for District Court Jalandhar Recruitment 2017 on or before its due date. Session Court Jalandhar Vacancy 2017-18 notification is out. As per the Notification, there are 20 Peon, Orderly, Waterman, Chowkidar, Mali and Sweeper Vacancies. The educational for Jalandhar District Court Recruitment is a middle pass for Peon & Sweeper jobs in session court Jalandhar. The age limit is 18 to 37 years. If you are looking for District Court Punjab Recruitment then this article is only for you. The candidate must have passed the middle examination and should have knowledge of Punjabi language. Rs. 4900-10680/- and Rs. 1300/- Grade Pay. 18 to 37 years as on 01.09.2017. As per Punjab government instructions. If you are interested in District Court Jalandhar Recruitment then you can send applications in prescribed Performa which you can download from the official website or from the link given below. You have to send the application along with the attested copies of relevant/necessary documents, 02 recent passport size photographs, out of 02 photographs one should be pasted on the application form. You can send application form before 13.10.2017 (up to 05.00 PM). Applications received after 13.10.2017 up to 05.00 PM either by post or otherwise shall not be entertained. The last date to send applications for peon or sweeper post is 13 October 2017. Venue of interview and schedule will be updated soon on the official website or you can visit this page for upcoming updates. The department has announced the list of selected candidates for the interview. The candidates who had applied for the above post can now check their result on the link given below. 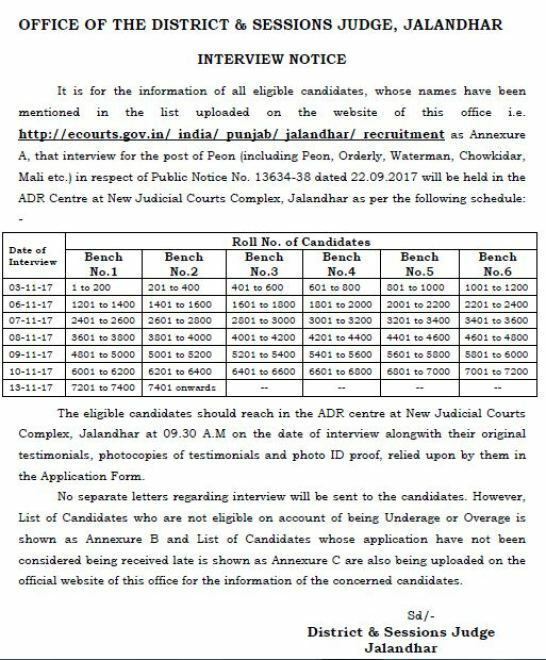 The interview will be held on 03,06,07,08,09,10 and 13.11.2017 at 09.30 AM in the ADR centre at New Judicial Courts Complex, Jalandhar. Office of District & Session Court Jalandhar has given an invitation for the recruitment of 14 Stenographer Grade III/Steno Typist Vacancy on the ad-hoc basis for the period of six months. The interested candidates can apply for District Court Jalandhar Recruitment 2017 on or before its due date. Session Court Jalandhar Jobs 2017-18 Notification is out. As per the Notification, there are 14 Stenographer Grade III/Steno Typist vacancies. The qualifications for Jalandhar Session Court Recruitment is Graduation. The age limit is 18 to 37 years. If you are looking for Stenographer Jobs in Jalandhar Court then this article is only for you. The candidate must be a graduate from a recognized university and should have passed 10th from with Punjabi as one of the subjects. The candidate shall have to pass a test at a speed of 80 words per minute in English shorthand and 20 words per minute in the transcription of the same. Fixed monthly emoluments of Rs. 11069/- in the pay scale of Rs. 5910-20200/- and Rs. 2800/- Grade pay. 18 to 37 years (As on 01 August 2017) for Gen. Category. Relaxation in upper age limit also available as per Punjab Govt. Rules. The selection for District Court Jalandhar Recruitment is going to be on the basis of written test and typing test. The candidates have to send applications on enclosed prescribed Performa along with attested copies of documents, and two passport size photographs with complete bio-data in the office of District and Session Judge, Jalandhar. 30 August 2017 (until 05.00 PM) is the last date of receipt of applications. e-court Jalandhar has given an invitation for the recruitment of 02 posts of Sweepers on a contract basis, at the minimum wages as per D.C/ Labour rates, for the cleanliness of Judicial Court Complexes at Jalandhar. Interested candidates can apply for District Court Jalandhar Recruitment 2017 on or before its due date. Session Court Jalandhar 2017 Notification is out. As per the District Court Jalandhar Notification 2017, there are 02 posts of Sweepers on a contract basis. The qualification criteria for the Sweeper jobs in District Court Jalandhar is Knowledge of Hindi & Punjab up to middle standard. The age requirement for Jalandhar Session Court is 18 to 27 years. If you are looking for Govt. Jobs in then this is the right time. The qualification criteria for the Sweeper jobs in District Court Jalandhar is Knowledge of Hindi & Punjab up to middle standard. The applications, with complete bio-data, contact number and attested copies of testimonials, if any, along with 02 recent passport size photographs, out of which one should be pasted at the top of the application form, should reach this office before the last date as detailed above. The candidate should not be less than 18 years and more than 37 years of age as on 01.06.2017. The relaxation in upper age limit is applicable as per the instructions of the Govt. received from time to time. No TA/DA will be paid to the candidates appearing in the interview. In case the cancellation/ postponement of the date of interview, its notice will be displayed on the Notice Board of this office. The candidates, who are to appear in the interview should report to the superintendent of this office at 09.30 A.M., on the date fixed. The last date to receive application is 27.06.2017.